Set 45 minutes off the mainland of Cairns on Australia's spectacular Great Barrier Reef, Green Island is a 15 hectare coral cay surrounded by spectacular coral reefs and is renowned as one of the leading environmental heritage sites in Australia. Green Island is also renowned as the only coral cay with a rainforest in the Great Barrier Reef. Enjoy this pristine natural environment guilt-free and experience the sheer beauty of lush rainforest and the stunning Great Barrier Reef on your next tropical island holiday to Green Island. 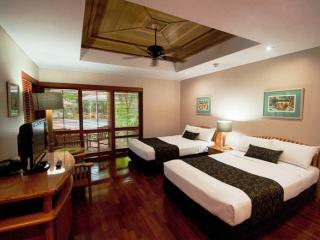 Offering an exclusive holiday experience, Green Island offers private luxury accommodation nestled in lush rainforest. There are 46 Island and Reef Suites to choose from, each offering elegant interiors, deluxe amenities and their own private balcony from which to enjoy the stunning views. Nestled in amongst the lush vegetation, the accommodation on Green Island consists of luxurious Island and Reef Suites all connected by walkways to the main island facilities. Green Island has a reputation as one of the most environmentally sensitive tourist developments in the world and has been awarded Advanced Ecotourism Certification for commitment to preservation and management. Maintaining a delicate balance between protecting its unique environment and catering to the needs of its visitors, all of Green Island's infrastructure and resort buildings were built with minimal impact to the vegetation and surrounding environment. The sensitivity to the Island's spectacular natural environment doesn't stop with its creation, in fact the whole of the resorts operations are based around principles of sustainability including rainwater, water supply and an onsite desalination plant as well as a tertiary sewerage treatment plant. The resort is also self-sufficient for its power supply with four diesel generators providing power from a sound proof building. Green Island's recycling and waste management is under strict guidelines and waste disposal on the Island is prohibited. All waste is transported back to the mainland where it is disposed of responsibly. As such, materials on the island are constantly re-used where possible. For its efforts in eco-sensitive practices, the Island has received a number of awards including Resource Conservation and Waste Management Awards and Australia's Clean Beach Challenge.